· Read it over the intercom. · Read it to students in courses. · Post it on the school website. 2. Administer the Latino History Quiz. 3. Administer the MAS Survey to find out if your students would be interested in taking MAS Courses. · MAS Texas is sharing a lesson plan from HECHO EN TEJAS. 5. Read a poem or short story written by a Mexican American author. · MAS Texas is sharing a list of poems by Mexican American writers. Visit www.MASTexas.org. 6. Invite a professor of Mexican American Studies, or a Latino writer to come talk to your classes. · MAS Texas is sharing a list of Mexican American professors who would be willing to visit your school. Visit www.MASTexas.org. 7. Watch the video by Mission High School Teacher Victoria Rojas on How to Implement Mexican American Studies at your High School. 8. Have students interview a family member. They can start with the basic question, “Where are you from?” Type that story and print it out for your family and friends. Invite students to share their family stories with the class. 9. Read a copy of the community newspaper The Librotraficante Times. Which article, poem, or art work caught your attention the most? Why? What articles would you suggest? 10. Watch the oral arguments in “Maya Arce vs Huppenthal.” This is the court case challenging the ban of Ethnic Studies in Arizona. Which side made the strongest argument? Why? What do you think the court will decide? How to Implement Mexican American Studies in Your High School. Although, implementing Mexican American Studies as a high school dual credit course is the "gold standard" available to any school in Texas, there are several other ways to bring these brilliant courses to your students. One reason to do is that research, including the Cabrera report, MAS students were 108% more likely to graduate than non-MAS students. Ten Ways to Implement M.A.S. (Mexican American Studies) at Your High School. 1. You can implement Mexican American Literature as a Dual Credit Course. Mission Valley High School teacher Victoria Rojas will lead a workshop titled: How to Implement Mexican-American Studies in Your High School, Friday, February 27, 2015 10:30 AM - 11:45 AM in ACAD 139, for the 2015 NACCS Tejas Foco. 2. You can implement Composition II/English 1302 with an Emphasis in Mexican American Literature. Successful completion of Composition II/English 1302 is often (But not always) a required requisite for enrolling in Mexican American Literature. Offering English 1302 as a Dual Credit Course with an Emphasis in Mexican American Literature paves the way for the full fledged Literature Course the following semester. 4. If you teach Spanish, add Mexican American Literature as an emphasis. We will be creating a list of readgins for this option. You can incorporate Mexican American writers into your other English courses, Language Arts, Creative Writing, History, or Film Course. Our Website has a list of authors and Mexican American Authors to choose from and some lesson plans. Once a teachers sees how their students are inspired by authors they can relate to, they will want to introduce more M.A.S. courses. 5. Hispanic Heritage Month: September 15-October 15. The MAS Texas website has a great list of authors and films for Hispanic Heritage Month. This can compliment a MAS Course or serve as independent displays. We also feature MAS INFO on some of these authors which includes not only biographical information, but Texas ties, and also powerful primary sources. 7. Advanced option: The Research Course: Encourage your school to offer any one of the above approaches above one semester. The following semester your school can offer the research course. So for example, offer LOTE Spanish Special Topics Mexican American Literature one semester. Offer the Research Component for the course the following semester. 8. Advanced option: Increasing Course Levels: Offer Increasing levels of a course: For example, first offer LOTE Spanish Special Topics Mexican American Literature First Level, then the next year or the next semester Second Level, then Third Level, then Fourth Level. Note , for 4th year English, you can request an Innovative Course, such as English with the Endorsement, in the form of Mexican American Literature. Permission must be requested from a school board. 10. Advanced Option: The Texas 16 Option: Students can Request the Class: If 16 students, request a course, Texas State Board of Education policy allows for that course to be offered. Ask us how. Quantum Demographics: As we refine the path to implementation for MAS and create the kit to conduct the classes, we will also identify leaders in African American Studies, Native American Studies, Asian American Studies to offer those classes also. Welcome the to the Multicultural, multimedia era. MAS Texas will be providing curriculum, syllabi, lesson plans, and lecture notes through our MAS Texas Tool Kit. We are releasing information slowly, but the MAS Tool Kit will be in full operation July 31. Here are some notes on the Mexican American History 6 week Curriculum created by our colleagues in the Rio Grande Valley. The curriculum is ready for anyone to use. The first two 6 weeks are the "extended" curriculums and the rest are the basics anyone can use. The goal is to have extended curriculums by the end of the summer which will included the teaching materials. These documents are important because now schools have the curriculum to build their MAS classes, and only need to modify them for their local district needs. Please distribute widely to locals that are seeking to include the MAS social studies course in their district. I have said before we are working on short deadlines to have courses up and running Fall 2014. So far we have four ISDs committed in the Lower Rio Grande Valley. Authors of the curriculum were Victoria Rojas, Mission High School, and Juan Carmona, Donna High School. We will be forwarding teaching materials and resources as the summer moves along. The Rio Grande Valley Coalition for Border Studies and Mexican American Studies held its first MAS High School workshop on Saturday. Besides the social studies course, we are expanding to include MAS Literature, MAS Fine Arts, and MAS Humanities. The curriculum for these courses will be developed during the summer. The courses are being created through the innovative course sequence. Top 10 Chicana Films for M.A.S. Why are we creating a list of Top 10 Chicana Films for M.A.S.? Because you demanded it! 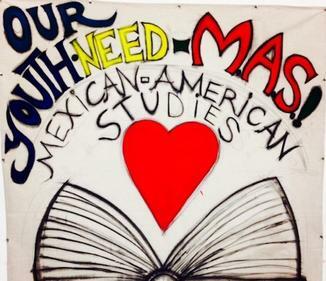 Mexican American Studies (MAS) will spread like wildfire because people love it. One example is all the great feed back to my last essay: Top Ten Chicano Films for M.A.S. It's included in the MAS Texas Tool Kit to help teachers implement MAS or use MAS for a lesson plan. For me it's a practical guide to use for my Mexican American Literature Course at Lone Star College-North Harris. I wanted to find out what our community really wanted to learn about, so I crowd sourced my syllabus. The reaction has been great, and had evolved into 2 other interesting lists that can also help teachers conduct MAS, but which folks really want to talk about. List one: (This one in front of you.) Top 10 Chicana Films. List two: Deep Thoughts on Chican@ Films. I want to thank Linda Garcia Merchant for all the work she had done for our community through arte and for sharing her insights on this list. We will have her on the NP Radio Show to talk about this. So did your favorite make the list? Do you have any more to suggest? We'll list your responses here. See you in class! Tony Diaz, El Librotraficante. So here are the 15 Chicana films. Compiled by Linda Garcia Merchant. 15. Palabras Dulces Palabras Amargas. Director: Linda Garcia Merchant (2009). (Classroom clock: 45 mins). 3. Senorita Extraviada, Missing Young Woman. Director/Producer: Lourdes Portillo (2001) (Classroom clock: 74 mins.) Story of the murdered women of Juarez Mexico. 2. A Crushing Love Chicanas, Motherhood and Activism. Director/Writer: Sylvia Morales (2009) (Classroom clock: 58 mins). Sequel to Chicana. 1. Chicana. Director/Writer: Sylvia Morales (1979) (Classroom clock: 23 mins). History of Chicana and Mexican women from pre Columbian times to the present. Linda Garcia Merchant, Technical Director, Chicana Por Mi Raza Project, Digital Media Partner, Somos Latinas Oral History Project (U/Wisconsin Madison), MABPW Collection (U/Illinois Chicago), Producer, Voces Primeras. Deep Thoughts on Chican@ Films by YOU! List one: Top 10 Chicana Films. List two: (This one): Deep Thoughts on Chican@ Films. Below I've cut and paste the great questions folks have brought up. I'm going to use them in class to lead discussion. Thanks for all your input. It's thrilling to use technology to fuel our passion for cultura. 1. Armando Bernal: Distinguish between feature films and documentaries. I love your film list. I've used film in my classes to initiate discussion. I think you might have to split your list into Feature film and Documentary. I would think that a feature would be a film with a story line, whether true or fiction. For example, the film 'Walk Out,' even though true or based on true events would be a feature, as would be the movie Selena. Where as, 'Real Women Have Curves' definitely fiction (but very true as far as it concerned life). Features would have a story. Documentaries are narrated films where the facts and information are documented as in 'Class Apart.' Of course, biographies stand out all their own. Bio-pics like 'Chavez' could be a short augmented list. I think something like this could be a great published pamphlet. the concern here is "is it a Mexican film" or strictly a Chicano film. 2. Tony S Martinez Don't forget the silent era. We actually had people change their names to Spanish surnames to get jobs. Latinos where hot, then wwII, and Macarthy changed things. Also, let's look at small indie films. As bad as they are, they represent the current cognition of our youth. I'm talking about the constant portrayal of gang bangers, drugs, and machismo. Why? Interesting discourse. Maybe it's because that's how they see themselves on the big screen and there's no balance. How minorities are portrayed in films. Not just Latinos. Remember Bruce Lee came in and changed the way Chinese where portrayed. Rid us of the Charlie Chan stereotype. Then Chuck Norris came in and made them enemies. There's a lot you can do with this. That's why it seriously needs a curriculum. Good luck. I'm glad to see this happen. That's why I believe an Interdisciplinary approach needs to be implemented in film schools. Women and ethnic studies. That way we won't be viewed as the other, but rather, those others will embrace our similarities and honor our differences. 3. More are coming. If I overlooked your deep thought on Chican@ Film please send it to me again. THANKS!